Double-barreled hydration on the run. 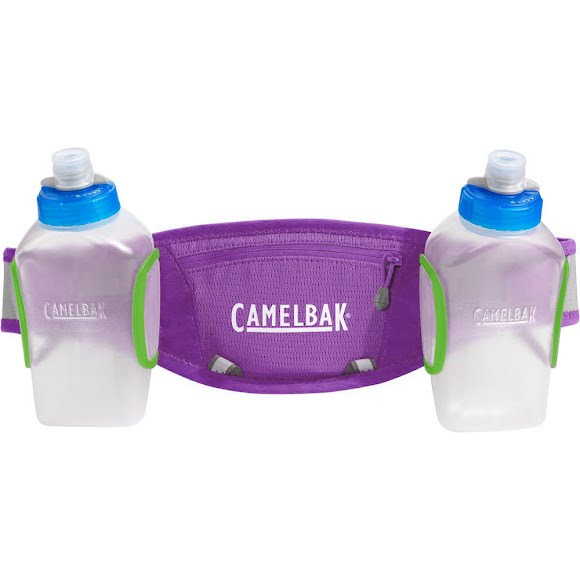 The Camelbak Arc 2 runner's belts comes with twin 10oz Podium ARC bottles that clip securely into bottle cages engineered to allow easy snap-in, snap-out access without looking or fumbling. And you can easily add up to two additional bottles/cages for longer runs. Double-barreled hydration on the run. The Camelbak Arc 2 runner&apos;s belts comes with twin 10oz Podium ARC bottles that clip securely into bottle cages engineered to allow easy snap-in, snap-out access without looking or fumbling. And you can easily add up to two additional bottles/cages for longer runs. Podium ARC bottles feature patented Jet Valve technology for bursts of hydration on demand with one simple squeeze. TruTaste liner means you taste only pure water-not the bottle-and twist lockout feature for leak-proof transport. Stretch belt material comes in 3 sizes with hook-and-loop closure for an adjustable fit that will sit comfortably on your waist. HydroGuard is a CamelBak proprietary antimicrobial technology embedded directly into the reservoir and tube walls. HydroGuard is an EPA-registered compound that uses the natural anti-microbial properties of silver metal to inhibit the growth of bacteria that can cause odors, discoloration or deterioration of the reservoir and tube. HydroGuard does not protect the user against disease-causing organisms. Always clean the bottle after each use.